When is Let It Be being released on DVD? "All the world is biscuits, so take a bunch, but not mine!" What happens if you send fan mail to Ringo after the 20th of October? He redirects it to me - my irl birthday is Oct. 21st, yay! Why did Yoko divorce George? One time while they were hanging out in the bag, he ate her chocolate cake. What did the newspapers say had gone to John's head? What year will Nutopia host the Olympic Mind Games ? John and Yoko are favourites to win gold in the acorns-in-a-sack race. What couples are expected to win silver and bronze? How many Richie's tracks are inculded in The Whiter album? Six tracks: Whiter Honey Pie , Whiter My Guitar Gently Weeps, Whiterbird, Whiter We Do It In The Road, Yer Whiters, and Happiness is a Whiter Gun. How did America react when Jesus said "I'm more popular than the Beatles right now"? A large State-wide campaign was started, lasting 3 hours, asking "Who Were The Beatles?". Heads were scratched, questions were asked, media archive footage was examined and shoulders were shrugged. What did the other Beatles do when Ringo went on holiday to Disneyland Paris for 2 weeks during the 'White Album ' sessions? Taking Ringo's lead of visiting theme parks that were poorly located, the other three booked trips of their own. John went to Sea World Kabul, Paul visited Six Flags Antarctica and George took in the sights of Legoland Zimbabwe. When Ringo returned to the studio, his drum kit was covered with what? Marmite. Paul charmed John into taking that line out. McCharmley wasn't charming enough to stop John from saying he didn't believe in Beatles. A year later, when Beatles fans learned that John cared enough about Paul to take out the marmite line, it gave them a flicker of hope that the group would get back together. Alas, the dream never came true. Blame who you will. Did The Fool On The Hill see the sun coming up or going down? Both. He had a great view. Development contractors tried in vain to purchase it from him, as it was prime real estate. He was far too transcendental to sell, of course. They eventually stopped bothering, and referred to him as a Fool -- a nickname which was immortalised in the Beatles song. Which Beatles song immortalised the fool on the hill? 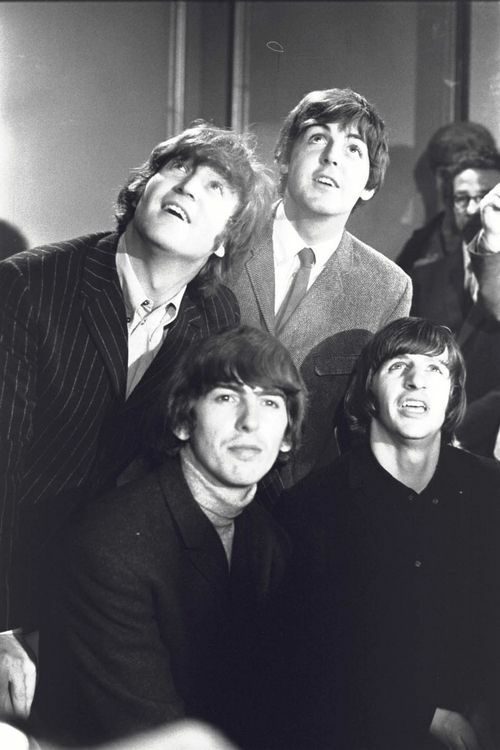 "'Til There Was You": "There were fools/On the hill/But I never saw them drooling..."
Why wasn't "A Hard Day's Night " filmed in colour? Tricky question. Since black and white are colours it was , indeed, filmed in colour! What were the beatles and Bob dylan doing in the selfie they took and uploaded to their instagrams when they met for the first time? Wrong. They are shades... of grey (or gray). Searching for the 8th Level. Dylan, being a lousy photographer even when he wasn't high, never fully grasped the concept of the "selfie". The result was the above "Beatlesie". Which was the only Beatle to not attend the wedding of Eric Clapton and Pattie Boyd and for what reason? George also didn't attend the wedding. This is because he did plan to go, but on the way, he was talking to the cab driver about the wedding, and the biscuits he would give to the couple as a present. Then, as a joke, the cab driver said to George: "I hear that Yoko will be at the reception. You better watch those biscuits!" George suddenly jumped up, causing the cab driver a put on his brakes, and George's biscuit barrel fell out of his arm and shattered to pieces. George and the cab driver had to spend the rest of the day picking up the crumbs, trying to assemble his digestives back together. Which Beatle was also a member of The Osmonds?